Asher, R. (1951) Munchausen's syndrome. Lancet, i, 339–341. Meadow, R. (1977) Munchausen syndrome by proxy: The hinterland of child abuse. Lancet, ii, 343–345. Porter, R. (1993) Body and mind. In Hysteria Beyond Freud (eds S. Gilman, H. King, R. Porter, et al). Princeton, CA: University Press of California. Rosenberg, D. A. 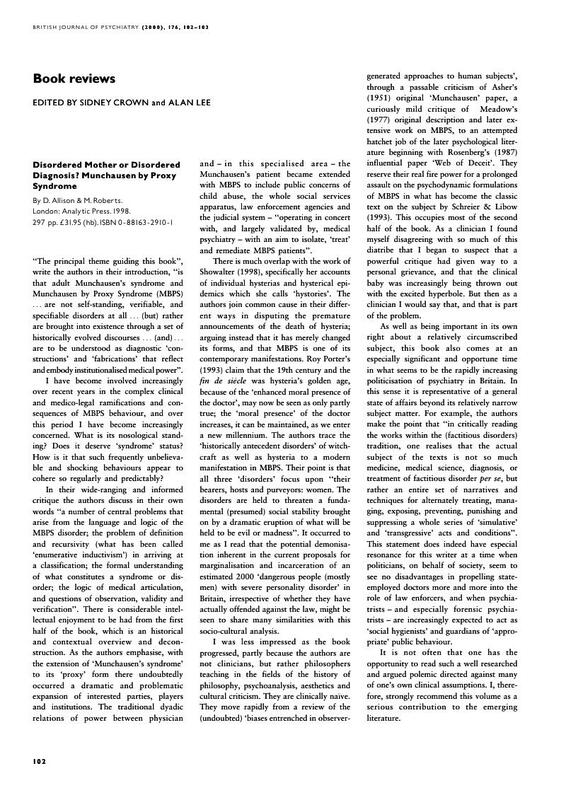 (1987) Web of deceit: A literature review of Munchausen syndrome by proxy. Child Abuse and Neglect, 11, 547–563. Schreier, H. & Libow, J. (1993) Hurting for Love: Munchausen by Proxy Syndrome. New York: Guilford Press. Showalter, E. (1998) Hystories. Hysterical Epidemics and Modern Culture. London: Picador.